Clang is support provided, CppCMS was tested against Clang 2.8. Significant performance improvements in XSS filtering by rewriting URI validation using a C++ parser rather then using complex regular expression. Added support of fully custom validation for HTML attributes using callback functions in the XSS filter. HTTP, SCGI and FastCGI backends - improved memory allocation for CGI variables. Fetching values from JSON objects using get(...), find(...) APIs is now done with 0 memory allocation. URL mapping is now done with 0 or very low memory allocation. Various filters like escape, urlencode and some others now work with no or few memory allocations. Performance improvements in caching by replacing the balanced binary tree by hash table in the primary cache key index. json::object had changed from std::map<std::string,value> to std::map<string_key,value>. It should be fully transparent for almost all users. Fixed a crash in http::response when writing HTTP headers throws due for example to incorrect file permissions. Fixed a bug in booster::regex that prevented some valid patterns to be matched against some regular expressions. Added initial support of Python3 for templates compiler. Added a workaround for systems that use python3 by default. 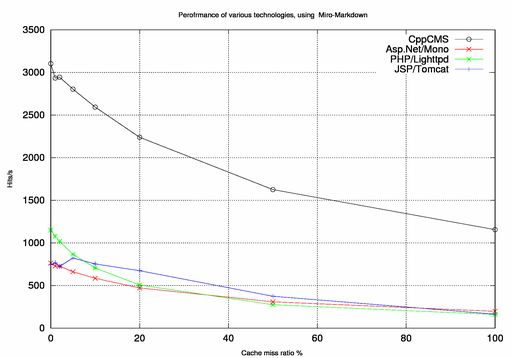 Long time ago I had posted a benchmarks comparing CppCMS based blog and PHP based one. I wanted to compare real life applications with each other. For a long time I had been searching for similar applications in several technologies doing very similar jobs in leading technologies: PHP, Asp.Net and Java/JSP. The last two were particularly important as they use static type system and "compiled" languages as C# and Java that are known to be faster then other dynamic typed languages like PHP, Python, Ruby and Perl popular in web development. Uses MySQL and the database and keeps open connections in pool. For each request access to database (if page is not cached), fetches the page content and comments for "sample article" in blog. Converts text to HTML using a markdown filter and displays it on page. Pages per seconds generation for different cache hit/miss ratio: stating from 0% miss ratio up to 100% miss ratio. For each test the application was "warmed up" with 100 requests to fill the cache, and then 1000 request with max concurrency of 5 request are done, while certain percent of them is new pages and the other are taken from "warmed up" once. I used the fastest Markdown implementation I had found. The Java implementation is based on the above C# and the fastest one I had found. Discount is the fastest C implementation of markdown that I had found. C#, Java and PHP implementation behave very similarly and without significant differences. 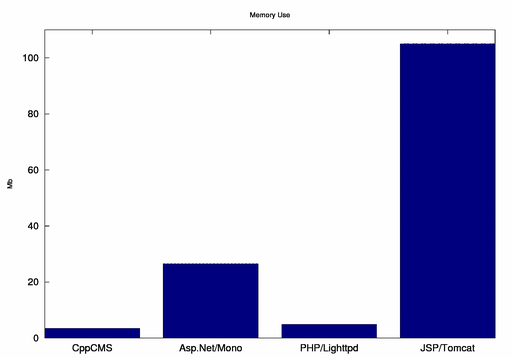 Surprisingly PHP behaves very well, in comparison to "compiled" languages like Java and C#. After doing some profiling it was clear that C implementation of Markdown was significantly faster then all other implementations. So I decided to create my own mini-markdown that make some basic handing of titles, lists, paragraphs and quotes at one level only. That is very simple syntax but implemented similarly in all 4 languages using same algorithm. The difference between CppCMS and other implementations was still significant but still much smaller then the difference between real markdown implementation. So the performance difference was less dramatic. And in the last revision I decided not to use any text filters by fetch ready HTML formatted content from DB and display it on the web as is. And would ignore hundreds lines of code used in any web applications responsible for the actual business logic. Using C++ with CppCMS provides significant performance gains in developing web applications even in very basic case. The performance is effected not only by the framework itself but also by many other libraries that are in use. 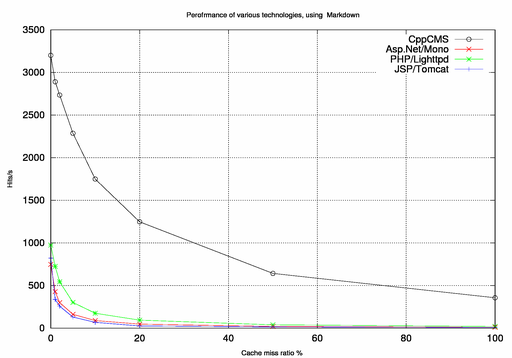 Using highly optimized C and C++ libraries may give significant performance gain in many cases. Such called "jit-compiled" languages as C# and Java and the frameworks based on the use significant amount of memory and still provide much lower performance then the one that can be achieved using real compiled languages like C++. It is good to remember that these benchmarks are still quite synthetic ones and in real life the actual performance depend on many factors - but using high quality and high performance libraries available for C++ have significant impact on performance. The Code can be downloaded from there. note, to run it you will need to have some libraries installed and configure some hardcoded paths to make it run. Version 0.0.4 of CppCMS had released. It includes optimizations required for using it in embedded systems. Caching is completely removed. Small memory footprint is very important for embedded system thus, caching stuff in memory is quite useless. Zlib compression are removed -- it removes dependency on boost::iostreams, zlib and bzip2 libraries. Removed dynamic templates loading --- this feature requires export of symbols to binary and increases its size in order to make RTTI work. Thus, all templates should be statically compiled into the binary. Changes in files based session backend to work properly with CGI mode including garbage collection (sessions that had time-out). Downloads are avialable from Sf Project Page. One of the latest implemented features of CppCMS is a caching system. The set of triggers --- this is a feature that is not available in many cache system like memcached. For example: main page that displays 5 recent posts may have a key main_page and triggers: post_123, post_124, ... , post_128. More then that, each time, during page build, when you fetch some cached data, like a sidebar or set of options, their sets of triggers are automatically added to the set of triggers of the page you build. For example, when the page is created and sidebar block is fetched from cache all its triggers are automatically added: if sidebar depends of options, then trigger sidebar and options will be automatically added to triggers of main_page. Thus, when certain trigger is risen, all pages that depends on it are automatically trashed. This makes a cache system quite powerful and easy to control correct data representation. The developer is expected to create a rational model of data/triggers that represent the relations between parts of internal data and rise these triggers when committing changes to database.